What could be easier than beef and veggies that grill to perfection in their own little pouches? A Brennan favorite Hobo dinners. 1. Heat coals or gas grill for direct heat. Spray half of one side of four 18x12-inch sheets of heavy-duty aluminum foil with cooking spray. 2. Mix beef, cheese, Worcestershire sauce, 2 chopped onions and 1 teaspoon seasoned salt. Shape mixture into 4 patties, about 1 inch thick. 3. 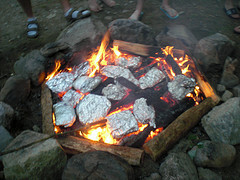 Place potatoes on sprayed sides of foil sheets. Top with beef patty, carrots, tomatoes and sliced onions; sprinkle with 1/2 teaspoon seasoned salt. 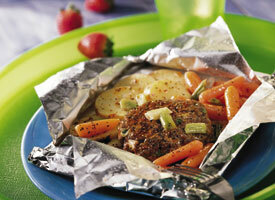 Fold foil over patties and vegetables so edges meet. Seal edges, making tight 1/2-inch fold; fold again. Allow space on sides for circulation and expansion. 4. Cover and grill packets 4 to 6 inches from medium heat 17 to 20 minutes or until potatoes are tender. Place packets on plates. Cut a large X across top of packet; fold back foil.